David Tischman has a long career in comics writing that spans both Vertigo and work at IDW—but his latest venture is a familiar idea on a platform you’ve basically never heard of before. For a decade, LINE Webtoons has been releasing free digital comics in Korea, but only came to Western countries last year. You’ve probably heard about it recently, as the service hosts an exclusive Star Wars comic retelling the saga from the perspective of Luke that was recently translated into English, but the platform is home to multiple original comics—and now, it’s home to Heroine Chic. Heroine Chic, set in a New York populated by superheroes, follows the life of fashion designer Zoe Porter, after she lands a job with the prestigious superhero costume designer Dyna Cuff. Zoe is thrust into a life of high fashion and supeheroics as she ultimately helps design the spandex and capes of the city’s most beloved heroes. 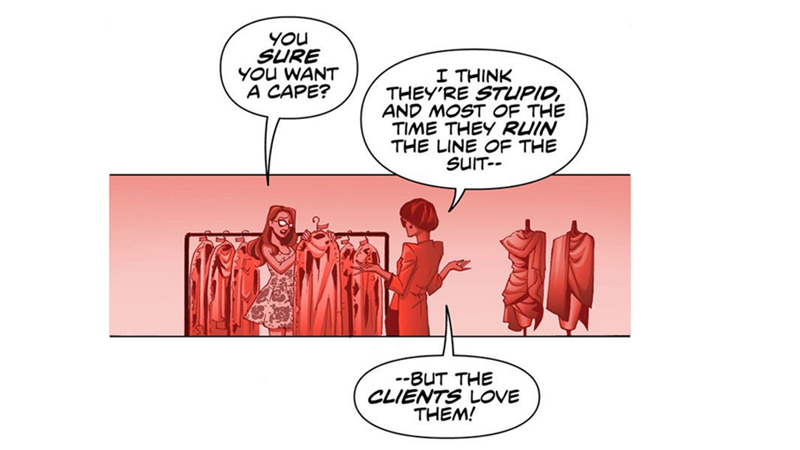 It’s an interesting move to see more Western-focused comics from LINE, especially in terms of original content—plus, Zoe’s boss, Dyna, is basically Edna Mode from The Incredibles right down to the hair, glasses, and general distaste for capes. That’s a pretty interesting idea in and of itself. Heroine Chic will release chapter by chapter on a weekly basis—but you can read the first three over at LINE right now.